On July 29th I sat on the back deck of the ferry to Patras and watched the sun set on the port of Bari, and on my month of detours along my journey to Greece. Inside the tiny museum dedicated to Saint Nicholas (so tiny I was the only one visiting on a Monday afternoon), there is a placard explaining Bari’s ability to join East and West, to peacefully bring together pilgrims from both the eastern and western Christian churches. It is a stopping point, the confluence of cultures. So here I step through the portal between East and West, I move eastward, moving further away from the home listed on my passport, moving closer to the home imprinted in my heart. I am always disappointed with the English language when it comes to the vocabulary to describe ones home – just one word is insufficient. What do we call a temporary home? What do we call the home that is not physical but the feeling we have when we are around that one friend, the one that has survived distance, and time, and separation? What do we name the feeling we get when we write our “home” on paperwork, but even as we write we feel we are betraying our truest selves? One line and a few marks on a paper to express ones identity is certainly not enough. What about the home we have no connection to but we feel as if it should be ours, like it has awakened something that had been sleeping somewhere deep inside of ourselves, something we never knew existed? And the home that is given to us by our ancestors, within our bloodline, the home we find expressing itself in certain innate personality traits, how our skin looks in the sunlight, how our heart beats when we hear the music from this particular home – what do we call that? If we can send a rocket to the moon, we can certainly expand the English language to more adequately communicate such emotions and expressions of identity. These are the thoughts that fill my mind as we pull out of port, the air is thick with the smell of sea salt and petrol from the boat that is now chugging right along, and Bari fades away into the darkness. As I admire the blinking light of the lighthouse in the distance, I hear English being spoken. My ears perk up to identify from which country – some Brits and some Canadians. The Brits (as they usually are) are fully prepared – they are already making sandwiches and breaking into the wine they’ve brought along for the boat journey. “Would you like some?” God bless them. “Yes, I would love some.” This particular Brit offering has traveled far and wide himself, having worked for several years for an English newspaper in Cairo. His name is Laurence. “Like Lawrence of Arabia.” I say. He nods his head, humoring me even though he has probably heard this a thousand times, and he says he has just recently seen the movie which is perhaps a bit too long , too much desert to hold ones attention, even those with the name Laurence. We talk a lot and laugh a lot and share the tiny champagne bottle Shahul gave me before I left Bari. I tell Laurence it is the silver lining, my consolation prize for having my phone stolen. An iPhone for a bottle of champagne to share with new friends, on a boat traveling through the Adriatic and Ionian seas – not a bad trade! There are many travelers that write about the beauty and introspection one experiences while traveling by train, watching the world go by from their window seat. While I love the train, the sea makes me serene, and traveling by boat pacifies me. 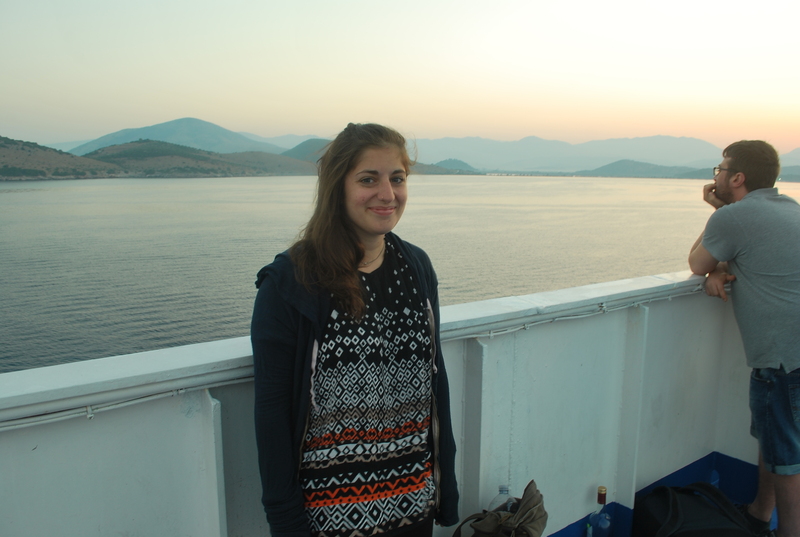 The boat journey to Patras was so welcome I even felt a tinge of sadness when disembarking. Traveling by sea is a moment to catch ones breath, the in between, before you must grab your bags and be fully alert once again. I am rocked and lulled into a pleasant state of mind on a boat – I am mesmerized by something so heavy having the ability to float. You have nowhere to go on a boat, you just have to sit and patiently wait. After night falls, to those on land and other boats that pass us in the night, we are just a single light in a sea of black. To look out from the deck is to stare into the dark abyss in every direction. When it is time to go to sleep, all of the backpackers and travelers scatter to find the best “deck” spot. Laurence of Arabia convinces me to sleep on the top helicopter pad I have been eyeing and wishes me goodnight as he seeks out a spot inside. 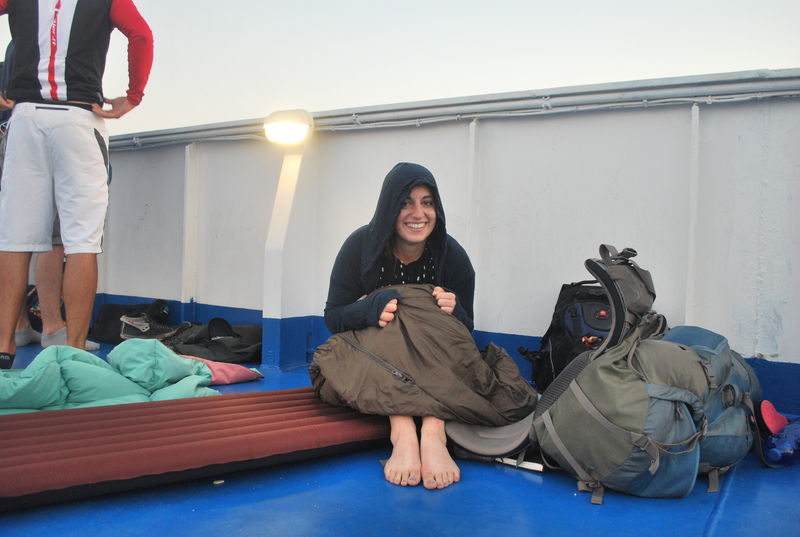 On the roof there is no coverage from the wind at night and no coverage from the sun in the morning, but this is its allure, and I unroll my tiny mattress pad and sleep sack along the ferry boat wall and curl up, my rucksacks snap linked to me. The wind whips my hair across my face and howls in my ears but it does not bother me, I am in and out of sleep, experiencing dreams mixed with memories, I dream of the time we traveled from Bari to Greece on this very boat route, with my family. I think I am just 9 or so? We saw dolphins along the way, diving in and out of the waves, playfully accompanying the boat before they dashed off. I wake up at dawn and peek out of my sleeping bag– only 5 or so of us backpackers gutted out the salty wind and elements the whole night through. It is 6am, I have barely opened my eyes until I have unzipped my sleeping bag and I am standing so I can see just above the lip of the ferry railing, and as if I have forgotten I am on a boat, my jaw drops in awe. The sun has just begun to show its face and glitter off the bluest of blue water that is still and smooth as glass. 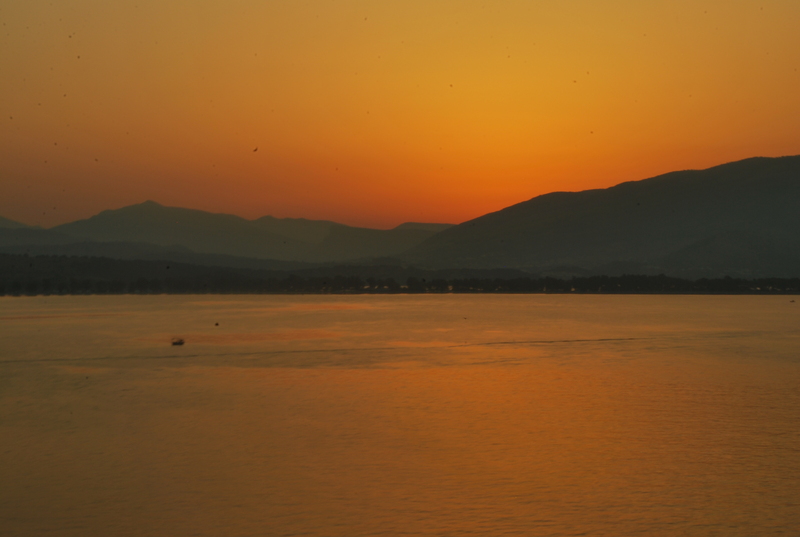 A ball of fire in pinks and oranges is rising over the green mountains of Greece as we begin to pull into the port of Igoumenitsa – the first stop. Right at this second Laurence comes through the door, onto the deck, and catches me with my mouth hanging open, light hitting my eyes as I am still trying to focus, in this moment of pure and utter bliss. I can do nothing but smile, he sees my face and understands immediately. I am rendered speechless. “ I must have a picture of this!” he snaps away and I too drag out my camera, feeling with each click of the shutter that there is no possible way I could record and prolong this minute, this dot on my timeline that for a moment feels like eternity. But right now it feels like everything, as if I was born inside this sunrise, on this mediocre ferry boat, on this helicopter pad in the salty sea wind, standing barefoot on my sleeping bag and in yesterdays clothes, pulling into the port of my Ithaka, my beloved Greece. In the story of the Odyssey, Odysseus returns to Ithaka, dressed as a beggar, old, weathered, and poor, yet even when no on else recognizes him, his faithful dog Argus wags his tail and sees him as he once was. This is how Greece greets me now, wagging its tail and saying “I have not forgotten you!” Once I can peel my eyes from the horizon I look around the deck to see who else I share this moment with and they too are silent. I think that maybe these people are thinking of a certain person, a certain face, but for me its as if every memory and moment has converged at once, cancelling each other out and suddenly my mind is quiet – blank even. Nothing. Just this water, and these mountains, and this rusty ferry boat rail I imagine climbing over, diving off of, into the deep blue. There is a couple (they must be about 55 or so) camped out on the deck, sleeping bags and a coffee thermos in hand. The man pours a cup for his wife and they take in the sunrise together. I imagine this to be me down the road, I can only hope, and if I ever have kids this is what I would tell them about. I would tell them they are like the sunrise after camping in the dark all night, a morning song bird over the Aegean dipping into the waves and welcoming me into port, the glow that sets the world alight, the sunlight warm on my face. I hear my moms voice: “you have eyes like the Aegean and hair like honey,” she says. This is what she would tell me, not just in expressing loving parental admiration but a reminder that no matter how many places you go you are anchored somewhere, your eyes give you away, alluding to somewhere deep in the Aegean and your hair like the honey collected on these mountains. Symbols of things she loves. Once we arrive in Patras I immediately feel more at ease. I bid farewell to my boat friends, to Laurence. I read all of the signs just to hear the words roll off of my tongue, like a kid might compulsively run their tongue along their teeth once their braces have come off. The bus to Athens hugs the sea the whole way and once I get to the busy Kiffisios bus station I am too exhausted to navigate metros and buses. I hop in a taxi and guide him to my Aunt Tenia’s address – her home just so happens to be blocks away from my first home in Athens, a childhood home. I am literally retracing the steps I took as a little girl. I arrive and Aunt Tenia receives me in a warm embrace, my Aunt Cathy and cousin Lauren are also visting and suddenly my long journey for a moment turns into a family holiday and it is relaxed and perfect. We go downtown to Plaka for dinner and again, with this bubbly feeling, my mind blank, my heart beating fast, as the Acropolis all aglow in its spotlight holds my gaze. Yes, we must expand the English language. There are not enough words to communicate home, to identify what I feel here. I feel all at once ephemeral and eternal, as if I could happily die right now – but I couldn’t possibly, I will feel like this forever right? How can one feel death if they feel this, here, now? They wouldn’t be able to recognize it I don’t think. We eat a dinner full of wine and octopus and squid and cheese and my hungry appetite for company from family and greek food is satiated. I am full and drunk on the arrival. I am here, I have made it, one step further! After dinner I call another old friend and his voice on the other end of the line is reassuring – amongst the inconsistency there is somehow consistency. We met at college in New York but he is Greek, his cousin and my brother went to high school together, and now he has been living back in Greece, working at my old elementary school. Life is funny sometimes. For whatever reason we didn’t necessarily spend a lot of time together the one year we overlapped in university, however I feel (like with many of the people that have somehow made their way back into my life) that we are meant to reconnect. We go out the next two nights, once again in the shadow of the Acropolis, sipping ouzo and eating olives. I watch the liquid turn a milky white as he pours it over ice and we try to “catch up” and decipher how and why we have found ourselves here. We share our uncertainties – Stavros might leave country once again to teach English, I muse about staying here in Athens and I’m not sure if its my deepest truest desires or the ouzo speaking. My last night in Athens before catching the bus North I tell Stavros I no longer care if those I write about in my blog read it, that I feel more comfortable being honest and vulnerable now. I don’t know why I say this because even as the words tumble out of my mouth I am thinking about how much time I spend filtering and adapting some of my thoughts and observations. Stavros responds but I am no longer listening, caught in my own stream of consciousness, and I am thinking Stavros has very nice eyes, and that I probably won’t put that in my blog because whats the point and implication in writing it? Then again, whats the point and implication in not? And then for some reason I remember a story my dad told me about his youth, how in middle school he was best friends with a charismatic girl named Randie, and all the boys liked her but they were just friends, and one day he tried to say “your eyes look pretty blue today” but instead he says “you have pretty blue eyes” and he was mortified (as any prepubescent boy might be) because this is not at all what he wanted to say. Once we get our drinks we end up talking about his girlfriend and how he misses her and how they spent many good evenings together at this very rooftop bar. He talks about how strange it is to return to a place that reminds you of someone when the person is no longer there. My heart aches for a moment because I know this feeling all too well. The empty stadium feeling, this feeling that you are in the company of ghosts. Or maybe everyone else is real and you are the ghost. The word “lonely” does not suffice because you are lonely for something specific, for a specific moment in time, and it is induced by your physical environment. You are experiencing the physical space anew with new friends perhaps, but you are living in the seen-and-done, stuck in a tableau, you will never think of anything else here, and this makes you feel like your hand is stuck fishing around in an empty jar. You can share this feeling with no one, everyone is experiencing their own eternal memories, creating their own future ghosts, stuck in their own timelines. I felt this way earlier that day when I took a walk with my Aunts and cousins to my first childhood home in Athens. We walked at dusk, I was unsure of exactly where I was headed, and then the muscle memory kicks in, and my pace picks up, and I walk, as Rimbaud once said: “one foot beneath my heart.” And then there I am standing in front of it, a little girl again, and I think that maybe my old dogs Jack and Bella might come running up to the gate, or that maybe I might see my brother chuck a water balloon over the side balcony (as we used to do to annoy our poor neighbors) and if I walk upstairs I might smell my mothers Rosemary chicken in the kitchen and dad will be setting the table on the balcony, and we will all sit down to dinner together to watch the city lights sparkle, and Lycabettus, and just maybe on a clear day like this, we will see the ocean in the distance. I never even thought about what sweet memories I had attached to this house (our first of 2 houses in Athens) and yet here I am, with that punched-in-the-gut sensation that always seems to take me off guard. I miss my family – not just my family but my family together, here– so much I have to close my eyes for a moment and remind myself that this is how life works. You experience things and then they end and you miss them, and then you experience new things and you miss those things too when they end, and then sometimes you even anticipate missing things before they even end, and I think that maybe I have reached my maximum “missing” capacity. I ‘miss’ too much and this often makes me feel isolated, different. “You’re different, and I like it.” Stavros’s friend Constantinos tells me as we said goodbye later that night. We had only talked over drinks for a couple nights but this strikes a chord with me, perhaps one of the simplest nicest things anyone has ever said. The next morning I bid Aunt Cathy, cousin Lauren, Aunt Tenia, and Alexi farewell to head north. In just three days we managed to re-visit many places I hadn’t returned to in years. We paid a visit to the beautiful state-of-the-art Acropolis museum and I was filled with pride by its beauty and careful design, each description and display doing the rich history of Ancient Greece justice, finally. We shared old family stories over long meals, stories passed down about the wars in Greece, stories of SS Officers and love stories and survival stories, and escapes in the night. Alexi has a gift for sharing such stories, his deep voice between slow puffs on his cigarettes suggests that this is indeed how stories are meant to be told. I wish I had recorded each one. I left Aunt Tenias and began my day bus journey up to the village of Argalasti. Since my phone was stolen in Bari I have had no music to carry with me and my thoughts run wild to fill the time. Bus journeys now can only ever remind me of one bus journey – the gauntlet of my bus journey experiences. As a naïve 19 year old I spent 16 hrs on a bus trying to get from Arusha, Tanzania to the southern village of Kidamali (near Iringa). Too scared to lose my seat to one of the many passengers in the aisles (or maybe a chicken), or get left in a tiny village, I rationed my water and waited to use the bathroom until we arrived. We passed through a national park (1 lonely white girl gawking like an idiot as we pass elephants and giraffes), and miles and miles of savannah. Everything clearly looks different now on this journey to Argalasti, but it also feels different, I feel different. And thank God. What if we all felt 19 forever? Perhaps some of the wide-eyed ignorance has faded away, but the excitement before arriving in a new place has remained and I am thankful for that too. 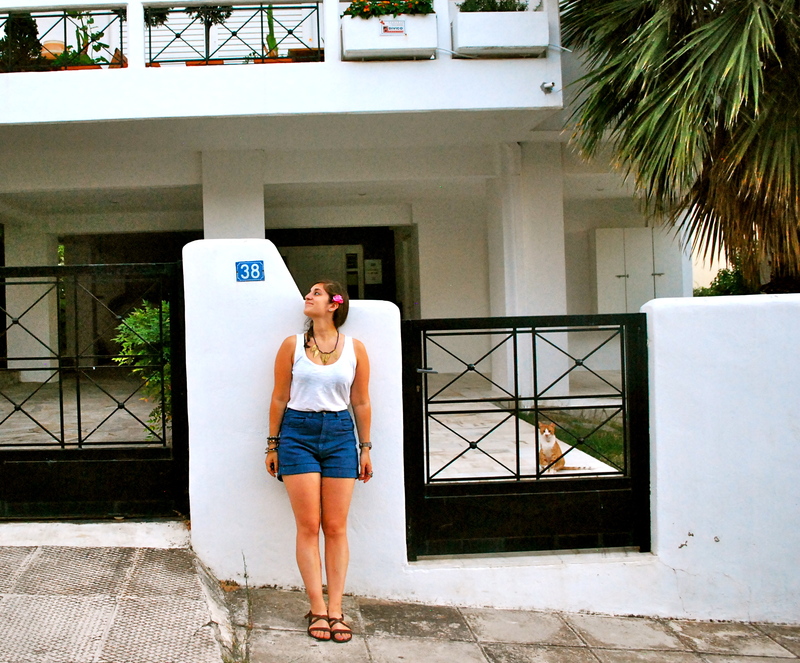 I arrived in Volos with 3 hours to catch the local bus to Argalasti, to begin my WWOOFing experience on a rural farm. With all the reminiscing and retracing of steps in Athens I am now happy to build new memories on top of the old ones. Never return to a place you once knew well, solely to do the things you used to do. This will turn one crazy, an emotional disaster. ah christa i love everything you have to say! and i don’t know about you, but i still feel like a gawking 19 year old, i just do a little better job hiding it haha. also i love you ability to talk to people you don’t know, you’re just a shining star! i want you to host a travel show, because i feel a little like i’m traveling when i read your words! Love you Annie! Thanks for always reading and all your kind words ;). Writing is a release for me, im happy I’ve finally taken the time to start doing it more consistently! Hosting a travel show would be a dream job haha.